Wow! Blue Bloods Season 8 Episode 22 started off with me in tears, and ended with me cheering. The smile still hasn't left my face. The snow covered cemetary set quite the scene as Danny visited Linda's gravesite. Listening to Danny talk to that stone with her name on it was heartbreaking, mostly because he sounded so lonely without her. Danny has family and friends, but no one will ever take Linda's place. When he told her he loved her, then took a beat, presumbly where she would said, "I love you more," and then replied to the silence, "I love you most," my heart ached for him. The way Baez called for him from the car made me wonder how many times they've made this visit, where she waits in the car and then tells him when it's time to go. But then bodies started to drop and it was time to get back to work. Who puts a hit out on an old lady named Ida? Permalink: Who puts a hit out on an old lady named Ida? That did seem odd. First there was Ida, then a 16-year-old girl, and an off duty police officer walking her dog. But the most dramatic assassination was Monica Graham as she stood on the street talking to Erin about getting a fresh start with her ex-husband. This was Erin's colleague and friend and it was completely understandable that Erin would be devastated after watching her get gunned down not three feet in front of her. At that moment I theorized that the killer could have been aiming for Erin, but the gift of a rewind function made it fairly clear that the killer was gunning for Monica. Frank drove himself crazy as his detective senses told him these cases were somehow related to the Prospect Park 6, even though they had no evidence to back up his hunch. Old Nissans around here is like pickup trucks in Texas. They're everywhere. Permalink: Old Nissans around here is like pickup trucks in Texas. They're everywhere. When the Correction Captain defended his treatment of Dewan by saying he was a bad guy from the start, it was easy to believe that was likely true, but it's equally true that cruelty begets more cruelty. But as Frank agonized over his guilt and regret concerning six men who lost nine years of their lives to the system after being convicted of a crime the didn't commit, Jamie and Eddie played, what would they do with a $5 million pay day? Eddie: A million for savings, a million for charities. Eddie: Charities. Cancer research, the food bank, those beagles they do make-up experiments on, I'm saving all of them. Every scene these two shared had me wondering if perhaps they were secretly dating and we viewers just didn't know it yet. When Jamie gave Manuel Escobar his card, I thought perhaps he was setting himself up as a target, but it turned out he was only trying to track down Dewan. RELATED: CBS Picks Up Comedies From Cedric the Entertainer and Damon Wayans Jr.
Later, I was shocked by how lax Jamie was while he sat in that patrol car. They knew that the hitman was still on the loose because it had just come across on the radio. He also had to know that a Reagan could be a target, and yet he rolled down his window, put his head back and closed his eyes. Eddie: Jamie, it was like I heard a voice, I swear to God. Jamie: That's called a radio. Eddie: No, serious, like I knew. I knew you were in trouble before you even were. Like I was warned. Jamie. Jamie: I'll spend the five million on you. Permalink: i'll spend the five million on you. With the name of this episode being "My Aim is True" they must have been talking about Officer Eddie Janko because those were some amazing shots. First she hit the guy's headrest, and then she shot and killed him with one shot to the head as he sped away. That was impressive, but not nearly as impressive as what came next. 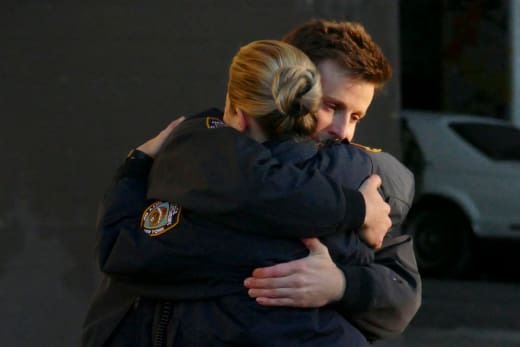 All I could think as Jamie and Eddie hugged in the middle of the street was please don't let them end Blue Bloods Season 8 like this and give us hope of this romance moving forward only to pedal it back at the start of the next season. CBS shows have a bad habit of doing that and leaving me dissappointed. JAG's Harm and Mac, and NCIS's Tony and Ziva come to mind. I actually stopped watching JAG because I got tired of feeling as though I was wasting my time. 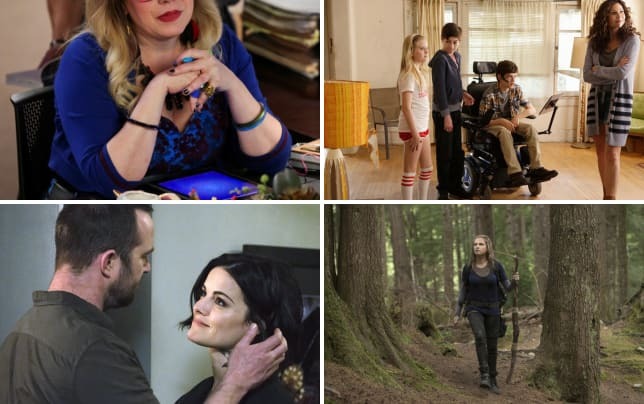 RELATED: Cancellation Scorecard 2017-2018: Which Shows Got Cut? But Blue Bloods proved me wrong, and I'm still smiling. When Jamie was late once again to the Reagan family dinner, I knew he was bringing Eddie, however I expected an announcement that they were dating, not engaged! My only disappointment was that we didn't get to see the proposal, but if we get more scenes like this in the future, I'll happily forgive that one missed moment. Eddie: I will always have your back. Jamie: If you fall behind, I'll wait up. Eddie: I'll earn your respect and pay you respect every day we have. Jamie: I'll be your scout, your night watchman, your calvary. Jamie: No retreat. No surrender. Eddie: No retreat. No surrender. Jamie: You can count on me. Eddie: And you can count on me. Permalink: And you can count on me. I find it difficult to believe that the NYPD has no rules about spouses working together as partners, but for the sake of the show, I'll happily set aside my disbelief. I'm certain these two will face plenty of obstacles moving forward, but if they face them together, I'll be satisfied. What struck me was how happy everyone at that dinner table looked. 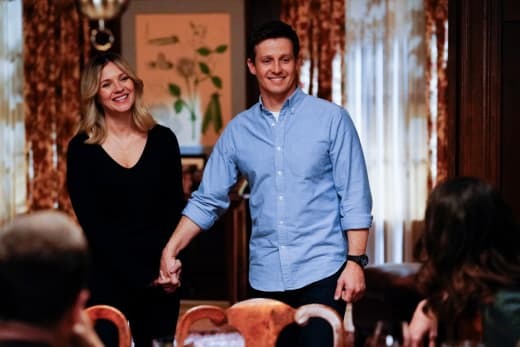 At the beginning of this season, a light was lost when Linda died, but Eddie's addition to the family brought back a light heartedness that's been missing. Erin looked in awe of the news. Nicky appeared teary eyed, and Danny wasn't far behind. I couldn't help but think that although Danny was thrilled for his brother, he was a little sad to be reminded of all he'd lost. I appreciated the heartfelt handshake between the brothers, and even Frank wore an expression that said things might be alright for the Reagan clan in the future. Best of all, we're going to have Eddie at the future Reagan family Sunday dinners, and that's sure to be fun! So what did you think TV Fanatics? Are you okay with the jump from partners to engaged couple? Are you a fan of #TeamJamko? And are you as happy as the Reagan clan? Thank you for checking in with me every week for my take on Blue Bloods Season 8. Hopefully we can all do it once again for next year's season 9. 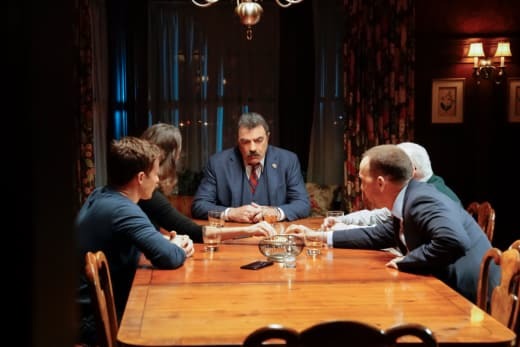 Until then, you can watch Blue Bloods online here at TV Fanatic.